Buy popcorn ahead of time and do some “wagon sales”! Take the popcorn door-to-door and deliver right away, rather than returning! Bring popcorn to work and be ready with the 4:00 munchies hit! Since our boys were Tiger Scouts, Pack 991 has slept with fishes, under stars, and on an aircraft carrier – in 2014 the Webelos Scouts are bedding down with wild animals! Webelos Scouts are invited to a sleepover at the San Francisco Zoo on Saturday SEPTEMBER 13! They’ll complete several requirements for the Outdoorsman Badge (required for Arrow of Light), get a night hike tour of the zoo, and meet with an animal keeper. It’s a unique opportunity to camp “in the wild”! There are limited slots available! Sign up here by August 25 and submit checks by August 29 (the Pack must pay by August 30)! Pack 991 faces the Pirates! Pack 991 is heading to the San Jose Children’s Musical Theater to see the Pirates of Penzance. This classic show is sure to delights Scouts, siblings, and parents, and attendance meets achievement requirements for all ranks! It is Fun with a Purpose! Can’t get access? Join the Pack991.com webpage to get access to photo galleries, too! Our next Pack Meeting is coming up soon, Thursday October 10th; It will be held at the Elks Lodge with the festivities kicking off at 6:15 with the pre-activity. At 6:30 the meeting will commence with the opening flag ceremony. The Theme of course is Halloween – Come dressed up in your scary outfit or as a Cub Scout, even scarier. We have a lot of fun in store for your Scout, this is a can’t miss event. Recognition will be given to those Scouts who have completed work toward any belt loops, pins, or achievements. Please make sure you get those in to your Den Leader. For those that have just entered Scouting and completed their first step, we will be holding a Bobcat Ceremony, complete with face painting. During the activities portion of the meeting we will set up various stations with games and crafts for the boys to do. We will close as usual with the Closing Flag Ceremony around 7:45 to 8:00. Please talk to your Scout prior to arriving about a key core value in Scouting; RESPECT – As defined by Cub Scouts – Showing regard for the worth of something or someone. We don’t expect our young Scouts to be perfect, but take advantage of the lessons that can be learned and the core values that can be instilled by talking to your Scout about the use of the Lodge prior to arriving at the meeting and if needed during the meeting. Talk to your older Scouts about having COMPASSION for and not scaring our younger Scouts. Although with the Haloween theme it can be tempting, we need to make sure that the environment at the Pack Meeting is Safe and Fun for all. COMPASSION is another core value in Cub Scouting; Being kind and considerate, and showing concern for the well-being of others. It is our privilege that we use the Elks and we need to keep in mind the following rules. Parents please make sure that your Scout stays with the group, that they obey the rules and our courteous to our host, the Elks. If we all take responsibility we will continue our long relationship with the Elks and stay in good standing. 1. Unless we are going outside for an activity the Scout must stay with the group in the designated room. Unless accompanied by you their parent. 2. If going outside, we will go through the front door and around to the field below. At no time should a Cub Scout or siblings be around the pool area, on the balcony, or any other location other than where the event is being held. 3. We are not to go through the doors leading out to the balcony, the doors are to remain shut, we have air conditioning if needed. 4. We cannot climb in the trees located in the front of the building or walk on the fountain. Although tree climbing is a favorite past time of our Scouts it is not appropriate at the Lodge. 5. Basically, be courteous and considerate when arriving at, during the meeting, and leaving the lodge. Again, please remember that using the Elks Lodge is a privilege so please speak to your Scout about good manners while on the Elks property. Sign up now for Show and Sells! In just a few short hours, your son can practice communication skills, sell $200 worth of popcorn (earning his leader a pie in the face) and help the Pack create great programs for everyone! Pick your time and date and let’s get Popping! With one (hot) weekend of sales, Pack 991 has already reached 10% of it’s selling goal. Many boys have already earned their opportunity to give their leader a pie in the kisser! 7 Hours of selling + 8 Scouts + learning to people skills = Scouting Success! If you haven’t signed up for a Show and Sell yet, do so! Boys learn to be assertive, to take rejection with a smile, and to experience success! Sign-Up for Show and Sells! Show and sells start September 7! You can reach your $200 goal in just a few hours! On behalf of all the volunteers that make up Pack 991, we welcome you back from summer and to the New Year in Scouting. I would especially like to welcome those that are new to Scouting. Your boys are in for a great adventure. Our Den’s and Pack emphasize a safe, nurturing environment, where we encourage our Scouts to try new things, push themselves to achieve, and plant the seeds that we are hopeful will embark them on a lifelong journey of citizenship and leadership. This Thursday we will be kicking off our meeting at Huddart Park, which is located at 1100 Kings Mountain Road, Woodside. Information about this and our other Pack Meetings are located on the Pack 991 Website. Scroll down a bit until you see “Upcoming Events”, click on the link and you will find a map to Huddart Park. Upon entering the Park, follow the signs to the West Meadow Picnic area. Pre-Activities will commence at 6:15 and the flag ceremony will begin promptly at 6:30 which begins each of our Pack Meetings. There will be fun, information, and adventure in between and then we will close the meeting at about 7:45 with the closing flag ceremonies and The Cubmaster Minute. Most future meetings will be held at the Elks Lodge in Emerald Hills which is our Charter Organization, but we wanted to take advantage of the light and summer weather while we still can. I am looking forward to seeing everyone from last year and welcoming the new families to the world of Scouting. If running late please call Shelli @ 650-315-1048 otherwise the hike will start at 4:05pm. This year’s picnic will feature water rocket launchers designed and built by each Den. May 30 at 6:30 at the Elk’s Lodge, we’ll have a building party where Dens can gather to create their rockets. Join your Den and prepare to Blast Off at the June 2nd Picnic! Every year, the Scouts of Pack 991 join many other Cub and Boy Scouts in honoring America’s veterans. They do this by placing flags on the graves at the Golden Gate National Cemetery in San Bruno. The Cemetery covers 161 acres and over 130,000 veterans and their family members are interred there. Placing flags is a wonderful way to help the boys recognize the meaning and importance of Memorial Day. The day of service begins at 8:30 with a ceremony (although arrival earlier, with check-in at 7:15, is requested and suggested). Then, boys are assigned a specific area in which to place the flags. This task does not usually take long, although if weather permits, Scouts are encouraged to salute each grave as it is marked. After the placing of flags, interested families can meet for brunch at a nearby restaurant. All boys who participate in the placing of flags on May 25th receive a patch, those who also participate in the removal of flags on June 2, will receive a pin. Please contact Rebecca Ratcliff (cliffrat (at) hotmail.com) if you would like to attend. Saturday April 13, 2013 Scouts from Dens 3, 4, 8, and 9 had an adventure under the sea at Aquarium of the Bay. Begin ning at 7:30 on Saturday night, the boys learned the difference between sharks and fishes, about the different kinds of water in the Bay and about taking care of fisheries. Led by 2 ebullient naturalists, the Boys earned their Wildlife Conservation Belt Loops, and were well on their way to completing their Wildlife Conservation Pins. Thankfully, the Aquarium had plenty of coffee on hand (and chocolate croissants) for groggy parents who “slept” in the shark tunnels with the 22 Cub Scouts, the 1 brother, and the 1 brave sister of a Scout who tagged along. Check out the photos! The Tiger Den 10 has arranged a visit to KQED on Saturday, May 4 at 10:30AM. They have a minimum number that they need to make, and with a small Den they need your help. Now’s your chance to see where the (non-profit) magic happens! Please contact Valerie Peoples (valerie@calcreek.com) if you are interested. Pack 991 Camp Fire Pack Meeting 6:30 Start Time, 6:15 Pre activity begins. Thursday April 18th, Elks Lodge. Camp Fires are a tradition in scouting and to honor that tradition Pack 991 will have our annual Camp Fire Pack Meeting. Right now it looks like the weather should be great as I am showing sunny and a high of 72 at 5:00 pm cooling down to about 59 degrees by 8:00 pm. Bring a sweater or sweat shirt, a chair or two if you have them and a flash light. This is also recruitment night, so bring a friend and their parent. The Meeting will once again start at 6:30 and will feature two core values; Resourcefulness and Faith. Come early and enjoy the pre-activity starting at 6:15, which is sure to be a great experience for all those participating. Those coming early will also be able to place their vote for the design of next years class B – t-shirt. We will have a crew from the local fire department there talking to us about fire safety. Additionally, for those who would like to participate hoping you are brushing up on your skit or individual talent. I hear there may be a song or two and lots of applause. Happy New Year! Looking forward to seeing everyone tonight at Belmont Ice, Friday, January 4th. Dress your children in layers, it is recommended that they don’t wear a bulky coat, but several layers so as needed they can shed the layers as they warm up. A hoody or sweat shirt over couple layers will provide adequate warmth and good mobility. Also it is recommended that they don’t wear jeans, as jeans can soak up water readiy and takes longer to dry, sweats or tights are recommended and will allow for more mobility. Wear comfortable socks, not to thick and preferably without seams. 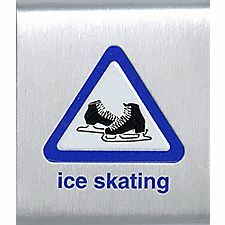 It is recommended that skaters wear a helmet, and should consider knee and elbow pads. Gloves are a good idea to protect the hands from cold and abrasions. Did you know Olympic Gold Medalist Brian Boitano and Olympic Bronze Medalist Debi Thomas used to train at Belmont Iceland?